Our Elementary students are always willing to put a smile on someone’s face, whether they are age 2 and Up! The senior residents of Lutheran Senior Life Center of Jersey City welcome a monthly visit from our Lower and Upper Elementary students, each time a memorable experience. Their visits have ranged from singing seasonal holiday songs, to enjoying a Fashion Show! Upper Eleme ntary students help prepare food for Blessed to Blessed Soup Kitchen. Blessed to blessed is a non-profit organization that organize global and community outreach to help those less fortunate. Our students were given the opportunity to assemble 100 brown bags containing fruits, snacks, energy bars, socks, and gloves to be distributed to the homeless in a local soup kitchen on a December weekend. Our Elementary students collected over 80 lbs of candy and donated to first responders and troops through Operation Gratitude. This is one of many service projects our students continuously participate in through out the year. A school-wide event was held on December 16th. Parents and children created “Bedtime Boxes” from shoe size and/or large boxes that were filled with bedtime essentials, such as a book, a stuffed toy, and a gift card. There were about 75 boxes collected in Zeppelin Hall. These bedtime boxes benefited children and families at the following organizations: St Joseph’s Home (part of York Street Project) Hope House,Newark YMCA Emergency Shelter, and Project Home. 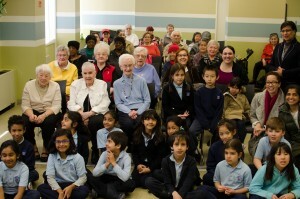 The Lower Elementary students walked down to sing to the residents of Battery View Senior Citizens Home in Jersey City. It was a unique and heart warming experience for our children to see how happy they made the older community through their songs and most especially by their presence. The smiles on the faces of both old and young were priceless. Our Upper Elementary chorus had a wonderful time caroling for St. Anne’s Senior Home. They also delighted the elderly with the recitation of ‘Twas the Night Before Christmas’. After their performance our young carolers sat down to interact and have lunch with their new friends. It was a rewarding experience for our students. Thank you to Mommies Heart 2 Heart for helping arrange this visit. Children collected over 80 lbs of candy that was sent to “Treats for Troops”. This organization sends out these treats to military personnel deployed abroad. Our Upper Elementary students composed letters and greeting cards to the troops, thanking them for their sacrifice and service to our country. The Elementary classes held a “Operation Shoebox” drive in collaboration with Samaritan’s Purse. The school donated over 50 shoe boxes that will be shipped to a girl or boy that have been affected by war, poverty, famine, or natural disaster. The Elementary students learned how to assemble boxes and how and what to pack. During the Social Studies Fair, the Elementary children made time to hold a fundraiser for the victims of the earthquake that struck Ecuador on April 16, 2016. They sang the Ecuador National Anthem and sold freshly baked cookies.The Elementary girls performed a dance to an Ecuadorian song which they choreographed themselves. Collectively they raised $393.22. An additional $200.00 donated by school brought the total to $593.22. This donation was sent through UNICEF to help those affected by the tragedy. In collaboration with Mommies Heart to Heart, Hudson Montessori School and its 200 families conducted a holiday drive in which they were able to provide 41 families with clothes, diapers, home supplies, toys and even furniture. Additionally they raised $300 and the children at the Hudson Montessori also made wonderful cards for these families. Despite all the busyness the end of the school year brings, our elementary students took time to present a small concert for their students. 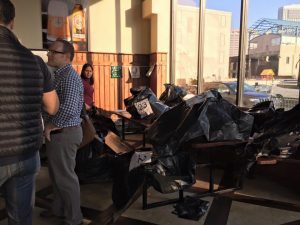 To create a world news event awareness, they spoke about the devastation caused by earthquakes in the country of Nepal. They explained the science of what causes them and gave a small geography lessons to their younger peers. 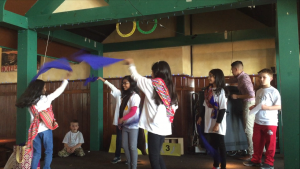 They sang the Nepal national anthem and presented the primary students with Nepal flags. They collected the money donated by our children and will sent it through UNICEF to help those affected by this tragedy. The Comets visited the citizens of Battery View Residents Home. 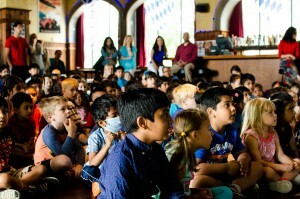 Under Ms. Tina’s musical direction, the children performed three wonderful songs which they sang beautifully. 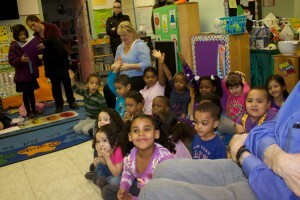 Our friends at the Center were so thrilled to hear the children’s voices as they welcomed spring. The children delivered fruits for the residents as they greeted them and shook hands with them. It was such a heartwarming and memorable visit to both residents and our students. March 2014 our first grade Galaxy class walked to York Project Center to sing to three to five year old children. The young children were delighted to have the Galaxy class sing to them. What a wonderful way to welcome spring! Our school participates in Operation Christmas Child, organized by our wonderful Parent Volunteers. On behalf of Global Harvest Fellowship and Samaritans Purse, we would like to thank all the children of Hudson Montessori and their parents who have donated toward Operation Christmas Child in December of 2014. We collected a total of 85 shoe boxes from our school that will be included with over 1097 boxes that will be shipped out from Bayonne and Jersey City to little girls and boys across the world who are affected by war, poverty, natural disasters, disease or famine. In response to the plight of the people of the Philippines, our First Grade students participated in the local drive of Blessed to Bless to aid people affected by Typhoon Haiyan. This past summer, Ms. Gracy Jolly conducted a motivational talk to local high school students of Jersey City. Her purpose is to inspire small business entrepreneurship and equip them with tools that will help them succeed. Before becoming a director at Hudson Montessori, Ms. Jolly was in the business world, she holds a MBA in Finance and a Master’s degree in Accounting, a well-qualified speaker to encourage these young entrepreneurs.